For patients suffering from chronic kidney disease, in-hospital dialysis treatment can often seem as unsettling as the illness. One in ten Canadians lives with damaged or failed kidneys. As a result, they aren’t able to properly remove waste and unwanted water from their blood. Dialysis is an artificial way of carrying out this process when a person has typically lost 85 to 90 per cent of kidney function. Unless one receives a kidney transplant, a person must continue to have dialysis for the rest of their life. “The tri-weekly, half-day dialysis treatments in a hospital clinic, not including time spent traveling to and from the facility, are extremely disruptive for patients, often impacting negatively on one’s family, social and work relationships,” says nephrologist Dr. Sachin Shah. There are 546 patients from Saskatoon and central and northern Saskatchewan requiring dialysis treatment. 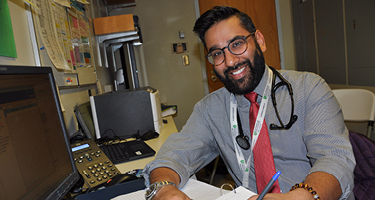 Fortunately, Saskatoon nephrologists have always been strong supporters of a “home dialysis first” approach, and this continues to be championed by Dr. Shah and his colleagues. Today, there are 173 patients doing dialysis in their homes via either hemodialysis in which blood is passed through a machine to clean it or peritoneal in which blood is cleaned inside one’s body rather than in a machine. “Dialysis done at home gives patients control of their treatment schedule, fitting it into their lives rather than the other way around, resulting in a more normal family, work and social life while on this life-sustaining therapy,” says Dr. Shah. Dr. Shah’s interest in home dialysis innovation was piqued during his nephrology fellowship done in London, Ontario in 2014. Training was made possible through a $72,000 fellowship awarded to Dr. Shah through RUH Foundation’s Fellowship Grants Program. To date, the Foundation has raised and invested $1.35 million through the Saskatchewan Health Authority’s Practitioner and Staff Affairs to fund fellowships for 37 specialists to pursue sub-specialty training in a variety of areas including trauma surgery; interventional cardiology; geriatric, child and youth psychiatry and critical care neurology, to name a few. To learn more about how you can support our RUH Foundation Fellowship Grants Program, please contact Lisa Sands, Chief Development Officer, at 306.655.6477, or email lisa.sands@ruhf.org.